In celebration of that pneumatic subway at Crystal Palace park which operated during 1864, a new passenger line was proposed beneath Hyde Park from Marble Arch to Knightsbridge and officially known as the Hyde Park Pneumatic Subway. The original plans were for a new tunnel in an almost due north direction. The plans were drawn up by Thomas Webster Rammell who was London’s main pneumatic transit promoter. These underground railways are invariably quite expensive and in the light of several aborted schemes Rammell decided upon a radical scheme which amounted to using a cheaper option. Instead of building a new tunnel he proposed the use of an old sewer tunnel! 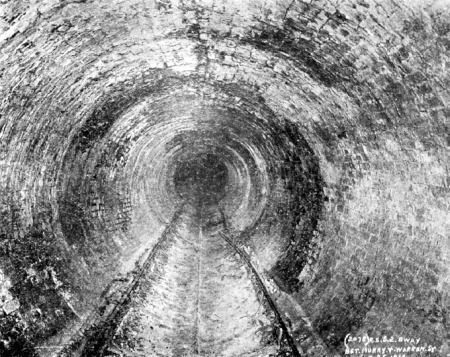 Clearly Rammell had got wind of what amounted to the abandonment of a major sewer tunnel beneath Hyde Park. How did that come about? In the early 1860’s Joseph Bazalgette drew plans for a relief sewer through Hyde park which was to replace that section of the old Ranelagh Main sewer. The new construction through the park, the one and quarter mile long Ranelagh Storm Overflow (or Relief) sewer, costing £23,000, was to form a connection between the Northern Middle Level and Northern Low Level sewer systems which would make for a more effective sewage distribution and disposal network. 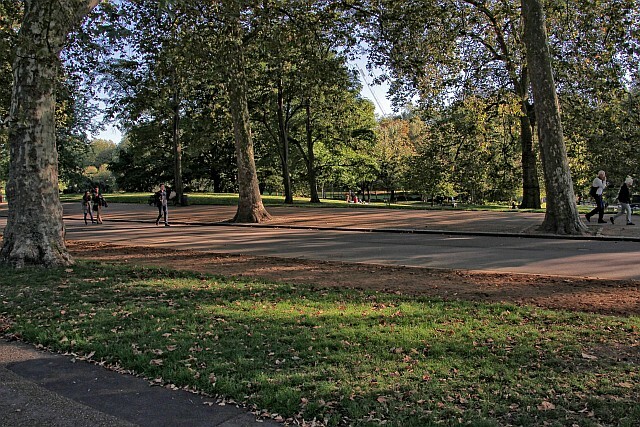 The new sewer would take a shorter route across Hyde Park between Lancaster Gate and Knightsbridge. It was completed in early 1863 at a cost of about £29,000. The old sewer had taken a different route. 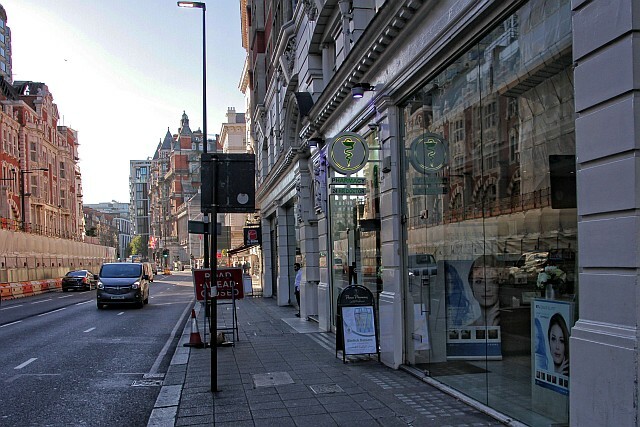 This was along Bayswater Road to Albion Street, near Marble Arch (where it picked up the Tyburn or Titchbourne Brook – not to be confused with the River Tyburn!) The sewer then struck southwards across the park. It is this latter bit that was to form part of the pneumatic subway. 1 – Original proposed route in entirely new tunnel. 2 – New sections of tunnel in second proposal which link up with the sections marked 2a – this section being the old sewer tunnel. NOTE: The map has been created with clarity in mind. The topmost shows Bayswater Road from Lancaster Gate to Marble Arch, the right side shows Park Lane, the bottom depicts Knightsbridge and part of the West Carriage Drive to the Serpentine bridge. There were some problems with the proposals. 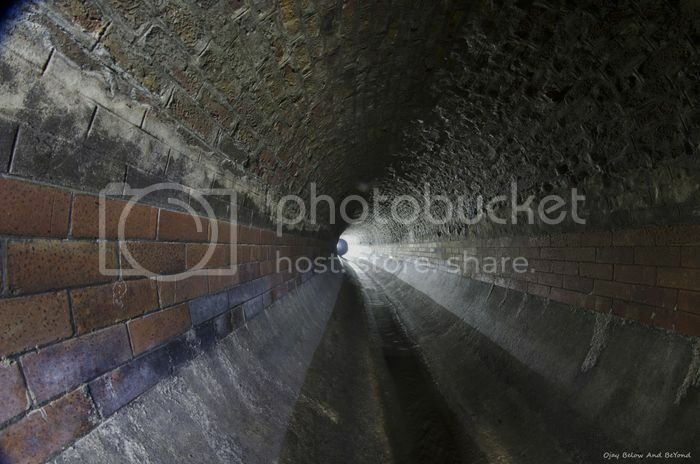 The old sewer had been built in 1813 so was quite ancient by Bazalgette’s day. It was no more than six feet in diameter, but in places it was six feet by four feet as the tunnels were in a bad state with an uneven invert. Clearly it would have to be re-bored to a somewhat larger size to permit the operation of a passenger pneumatic railway. A nine foot diameter seems the possible choice, as this was used for London’s earlier Tower Subway as well as the New York line. Rammell’s proposals however meant cheaper tunnelling costs plus a line that would be quicker to complete. It would have been quite a deep line with just the southern end at the proposed Albert Gate station being of shallow depth. Generally it would have been between 30 to 40 feet deep and it is presumed the north station at Cumberland Gate (Marble Arch) would have been of equal depth. The proposed line entailed two short sections of new tunnel plus the terminus stations. 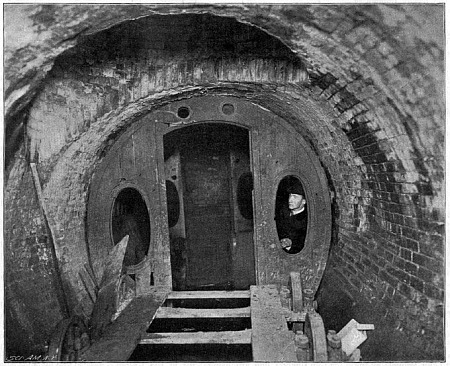 The old Ranelagh sewer tunnel would form the main section of tunnel, the whole length being just over a mile. Thomas Webster Rammell wrote to the Metropolitan Board of Works in June 1868 seeking the board’s permission to use the old Ranelagh main sewer for his railway. The Board’s reply is not known. There would have been no worries regarding sewerage for the old tunnel was to be blocked off anyway. As it turns out part of the old sewer tunnel still performs a minor duty draining excess surface water from the Hyde Park catchment. The Hyde Park line would have been similar to New York’s Beach Pneumatic Transit, designed by Alfred Ely Beach. It ran beneath Broadway and has been the only moderately successful passenger line of the type, managing three years of operation. Beach’s line give us an idea how that at Hyde Park could have looked. Remains of Beach’s Pneumatic tunnel – looking like an old sewer! The above & below images are sourced from Columbia University’s fascinating Beach Pneumatic article. Remains of the Beach Pneumatic subway car. Obviously the dimensions needed for the proposed Hyde Park Line would be greater than the Ranelagh sewer’s current six foot diameter tunnel. 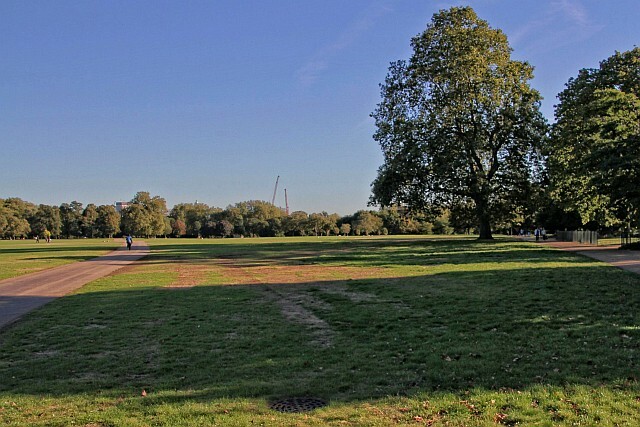 We now take a quick look at Hyde Park and where Rammell’s pneumatic railway would have run. It would have begun at Cumberland Gate. The closed toilets (quite aptly!) and the disused subways underneath the Marble Arch fountains could well have formed part of the modern station environs for the pneumatic railway – had it been built and survived to the present time. The pneumatic railway would have headed south west from Marble Arch across Hyde Park. 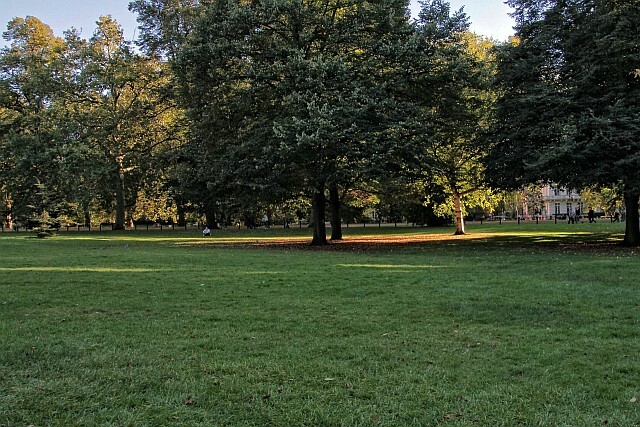 The Reformer’s Tree memorial. The Marble Arch tower is in the distance. This is roughly the point our pneumatic railway would have joined the older Ranelagh sewer tunnel which comes in from the left. The Ranelagh sewer is directly beneath this point as evidenced by the iron grille in the foreground. The combined tunnels head south east from here towards the Serpentine Road. The approximate location at which the pneumatic railway would have passed beneath the Serpentine Road. The Serpentine itself is about 50 meters to the right. The route would have been quite close to the surface in the vicinity of The Dell. The route heads across The Dell towards Rotten Row. The embassies at Albert Gate can be seen at extreme right. Just by Rotten Row the old Ranelagh sewer tunnel turns towards the embassies whilst the pneumatic railway would have dived into a new tunnel to head straight ahead for its terminus. 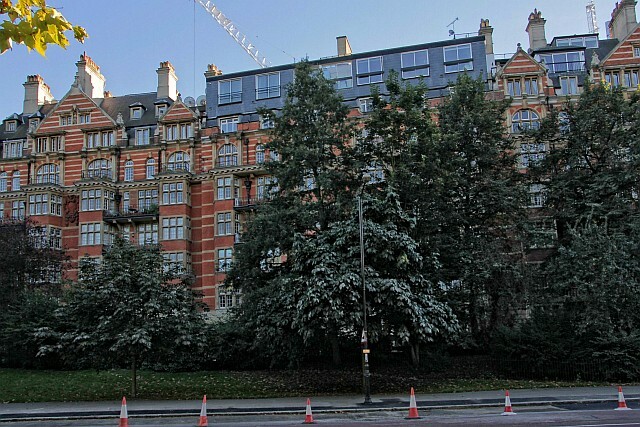 Rear of the properties in Knightsbridge where the pneumatic railway would have terminated. These substantial properties were not there when the railway was planned so construction of the station itself was not too much of a problem. 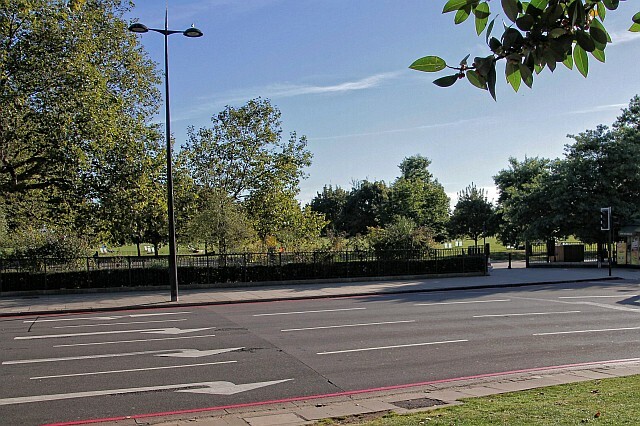 View looking west along Knightsbridge at the approximate point the southern terminus was planned.